The Vagator cliff is definitely a perfect location to sit back, have a drink, and enjoy delicious food with that fabulous view. 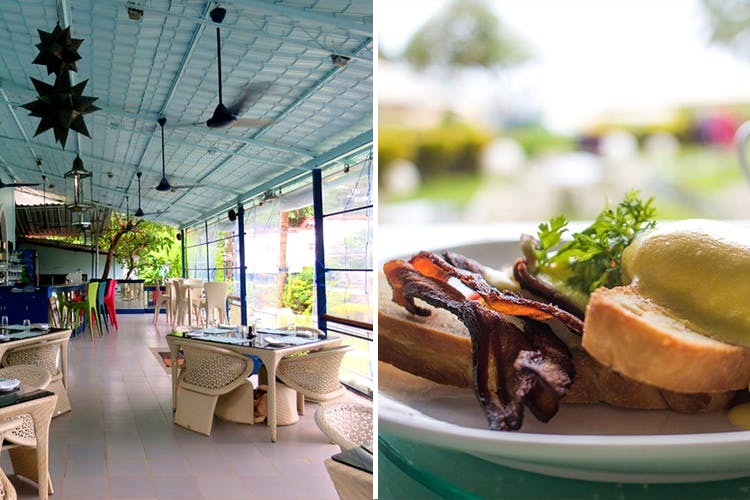 Thalassa offers all of that, and hence has become a must visit place when in Goa. Fortunately there are a few more places that achieve this trifecta in Goa and we have found them for you. The original restaurant located on the riverside at Cavelossim is a definitely a must experience on every visit to Goa. Great choice in seafood, fabulous views, their variety of drinks and the warm hospitality is what makes this a truly Goan culinary experience. Their selections of fine wines that are available also make this my favourite bit about the restaurant. Located on the cliff overlooking Vagator beach, going to this restaurant may make you feel like you are in the Crystal maze. That is how beautiful and expansive this hotel is. When you get to the restaurant, ‘WOW’ is the only word that comes to mind. And once you start enjoying the legendary ‘W’ service, their delicious Pan Asian cuisine courtesy Chef Tanveer, or their innovative cocktails, you will definitely be back for more. This is a hidden gem in fine dining in Goa. Located in the historic Tiracol Fort, which is now a Heritage Hotel, this al fresco space on the terrace of the fort gives you sweeping views of the river and the ocean. The menu might be limited, but be it their Spaghetti with clams, or their fluffy omelets for breakfast, you will never leave disappointed at this restaurant. Trust Francis the manager and his team to let you experience true Goan warmth in their service. Located at the juncture where the Baga creek meets the sea, this Fine Dining restaurant is another beautiful restaurant. And their wonderful food and service just makes this a perfect spot to go to. This year they have a South African chef offering his version of Barbequed meats as well as other European and African dishes. The outdoor al fresco seating, overlooking the sea make this another restaurant to check out on your next visit. All of these are open throughout the year.